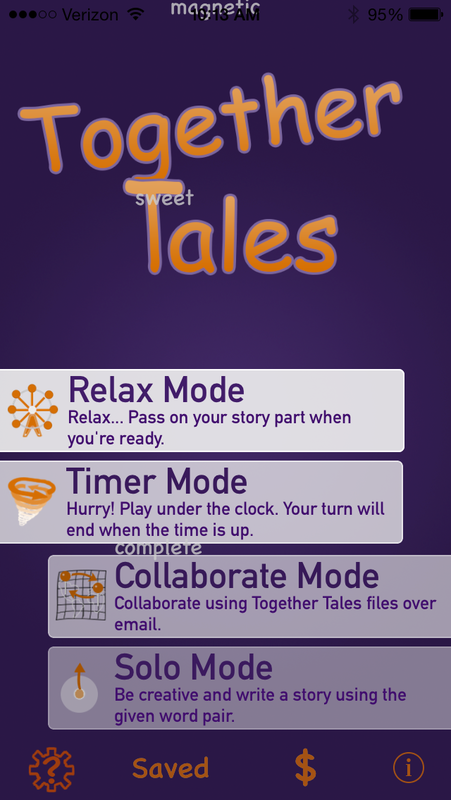 Together Tales is a fun, memorable story creation application for your iOS devices. It can be enjoyed by one to eight players. * Multiplayer mode where players take turns contributing to stories that are passed around from device to device in the same room, using wifi or bluetooth. This can be played with or without a timer. Results in one-of-a-kind stories that can be saved and shared. Lots of group fun! * Collaborate mode where players take turns contributing to stories. Send the stories as a Together Tale file back and forth between Together Tales app users until your story is completed. This can be played in a challenge mode where you are given word pairs to try to use during your turn. Great for friends in different cities, or simply as a slower thoughtful way to make stories with nearby friends. * Solo mode where you use given word pairs in short stories. Send to your friends when you are done. The (prescreened) words given are sure to make you laugh. A playful way to put your creativity to the test and share your creative gifts with your friends. App includes dynamic text, saved stories section, option to personalize the app color, optional Plot Provoking music. We offer In-App Purchases of "Story Starter" packages for those interested in some help with story direction. While these additions are not necessary at all to use Together Tales (the app comes fully functional), we offer these one sentence Story Starters for fun. Get 100 Starters for $0.99. An example of a Starter is: "I've deleted many things in my lifetime, but none more important than what I will refer to as The List."